As parents, we believe use of the word “dyslexia” in public schools helps steer discussions toward timely identification of our children, as well as toward appropriate interventions and accommodations. For those reasons, Decoding Dyslexia groups in every state in the country recently sent a joint letter asking the U.S. Department of Education to clarify that the word “dyslexia” may be used in IEP meetings and related documents. Be sure your voices are heard… it is important that educational policy makers and legislators at local, state and federal levels know the challenges involved in accessing services and supports for dyslexia in our nation’s schools. As parents, we are often told that dyslexia is “not recognized by school districts,” “is just an umbrella term,” “does not exist,” “is a medical issue,” or “is not something schools are required to diagnose or address.” We are also told in IEP meetings that schools are “not required to put the term dyslexia in IEPs.” In many cases, we are even told after years of failed efforts at reading instruction, that we may not discuss or include “specific methodologies” in an IEP to address our children’s reading struggles. Rather, more often than not, our children receive only the broad classification of “Specific Learning Disability” or, at best, “Specific Learning Disability in Reading” and are placed in general resource rooms with students who have different issues and needs. Some of these students with different needs may even fall under the same Specific Learning Disability “umbrella,” while others may have disabilities that fall within entirely different IDEA disability categories. Our children with dyslexia then receive interventions that are neither peer-reviewed nor targeted to their specific, individual challenges. For example, a student with good word decoding skills who struggles to comprehend the meaning of print material may have markedly different learning needs from a student who struggles to comprehend print material because of a weakness in decoding. Both may have the same “Specific Learning Disability” or even “Specific Learning Disability – Reading” label, but their needs are entirely different. The result is an unnecessary and often indefinite delay in the identification and use of effective “specially designed instruction” and interventions students need and to which they are entitled as part of an appropriate education. The term “dyslexia” is explicitly included in the IDEA as an example of a “specific learning disability.” Accordingly, the use of the term need not, should not, and will not affect faithful application of the individualized determinations the IDEA requires. The statutory and regulatory provisions of the IDEA would remain unchanged. Dyslexia is not a “medical” condition. Indeed, there are currently no medical procedures available to diagnose or treat dyslexia. Rather, it is a statutorily-provided example of a “Specific Learning Disability,” one which can be identified by appropriately trained school personnel charged with conducting psycho-educational evaluations to determine eligibility for special education services. 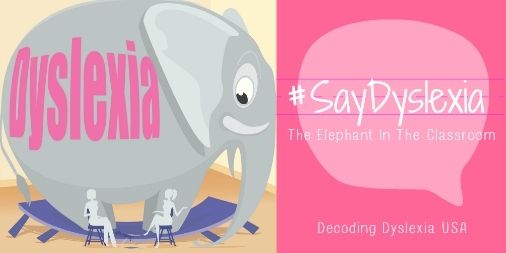 The use of the term “dyslexia” in an IEP is necessary, because it would permit parents, students, educators, and experts to “speak the same language.” These key players could then move quickly toward discussing peer-reviewed research and methodologies that address difficulties with phonological processing, word identification, fluency, decoding, and spelling skills. Use of the term “dyslexia” would provide a compass – not a directive – toward specialized instruction and services to remediate and accommodate identified, individual difficulties. In light of the concerns we have articulated, those expressed in the CCD letter, and the alarming statistics related to the rate of reading failure throughout the country, the Department’s leadership on this issue is critical. We respectfully request that you issue guidance stating that the term “dyslexia” may be included in an IEP to help ensure that schools provide an appropriate education to students with dyslexia in a timely manner.